One-piece Flow for Information Products? Organizations that produce documents — whether they are publications for sale, standard tests for schools, legal templates, or work instructions for production — face challenges that differ from manufacturing, because data and materials don’t flow the same way. The production of a document by a team is a process of collaborative editing, not a fixed sequence of standardized operations. With electronic documents, you need a revision management system to prevent inconsistent updates, you need to cap the number of documents in process to control lead time, and you may need to improve the work flow or increase the team size if saturated. Tools like 5S are irrelevant in this context, because the work takes place inside a computer network, not in the physical office, and setting up an effective network — with the right software properly configured — requires information systems professionals at the state of the art. What looks like rework in this context is a collaborative editing process that must be managed, not eliminated. Restaurant waiters who deliver food to tables of five or more customers rarely remember who ordered what, and have to ask. Most restaurants still use paper order forms, and the most common are not much help, because they tell the waiter what was ordered at each table, but not which customer ordered it. 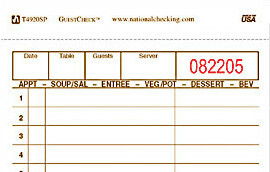 The row of titles on the top, with “APPT- SOUP/SAL-…” is intended as a series of column headers to record each customer’s choice in each category. The shape of the table. Where the waiter is to stand when delivering food. A clockwise numbered position for each customer. 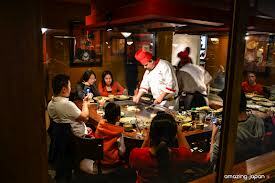 Benihana, however, goes one step further and takes advantage of the special characteristics of their service. It is a chain of Japanese restaurants in the US, with a single 8-seat table layout and a chef at each table cooking on a hot plate in front of the customers, from ingredients in a cart. The work done away from the table is limited to kitting the ingredients to match the customers’ orders. 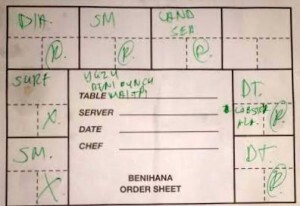 The order form is a map of the table, which is possible only because the tables are all identical, and the form can be filled out with abbreviations because the orders are all for full-course meals: “DIA” for “Diablo,” “SM” for “Splash-and-Meadow,” etc., with a few options, such as fried rice versus steamed rice. While this is effective at ensuring that customers receive exactly what they ordered, it is not mistake-proofing/poka-yoke. It does not physically prevent mistakes, nor does it have a mechanism to signal any error that may happen. A disorganized chef could still get it wrong, and customers could confuse any chef by switching seats. It is instead an application of the usability engineering principle of natural mapping. 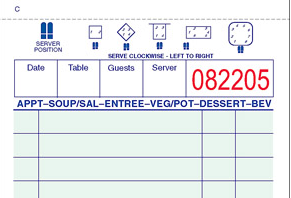 An order form that is a map of the table makes it easy for the chef to know which dishes to give to which customers and thereby reduces the likelihood of errors. Mistake-proofing would be better, if someone could find a way to do it. What would we say if, instead, this person had been tasked with throwing out all the machine tools of multiple vintages that make up the plant’s machine shop and replace them with one single, integrated Flexible Manufacturing System (FMS)? My recommendation to this person would be to find another job. Unless the company has gone through preparation steps that Hopeful does not mention, the ERP project is likewise headed for disaster and Hopeful should run from it. ERP boosters take it for granted that one single integrated system to handle all information processing for a plant is an improvement over having multiple systems. From a marketing standpoint, it is a powerful message, well received by decision makers, as evidenced by the size of the ERP industry. Yet most plants do have multiple systems, and it is worth asking why. It is not just because organizational silos are uncoordinated. It is also because the best systems for each function are made by specialized suppliers. The best systems for production planning and scheduling, supply chain management, maintenance, quality, human resources, etc. are developed by organizations led by experts in each of these domains. ERP systems are built by companies that grew based on expertise in one of these domains and then expanded to the others, in which they had no expertise. One major ERP supplier got its start in multi-currency accounting; another by dominating the market for Database Management Systems; yet another by focusing on HR management. Unsurprisingly, the software they provided in all other areas has frustrated practitioners by its mediocrity. Perhaps, the reason you hardly ever meet any manufacturer who is happy with an ERP implementation is that the idea of an all-in-one integrated system is not that great to begin with. First, management should respect the need for departments to have the systems that support them best, requiring only that they should be able to share information with other departments. For example, Marketing, Engineering, and Accounting should not be mandated to use modules from a single all-in-one system, but they should be required to use the same product IDs and product families, for management to be able to view sales, production, and financial results accordingly. To make this possible, the company needs a consistent information model of its activities, including the objects that need to be represented, the states these objects can be in, the information they need to exchange, and a structure for all the retained information. The development of such a model is beyond the capabilities of a production planner, and often beyond the capability of anyone in the IT department of a manufacturing company. It requires high-level know-how in systems analysis and database design, and should be done by a consultant who is independent of any ERP supplier, in cooperation with the operating department and the IT group. The first phase should focus on improving the performance of the legacy systems in targeted areas, and introducing middleware to facilitate the integration of data from multiple legacy systems. This involves work in Master Data Management for specs and nomenclature, Data Warehousing for history, and real-time databases for status. The replacement of legacy systems should be considered based on the lessons learned through improvement, in particular with a realistic, internally developed view of costs and benefits. As in the case with new production equipment, the introduction of new IT systems may best be coordinated with the development of new production lines or plants.